I thought I should add our Christmas pictures before the New Year. I've just been putting it off because I had so many pictures I didn't want to try to decide what pictures I wanted to post. So, here's just a little taste of our Christmas. Enjoy! I usually do all the Christmas decorating on my own because Cameron really does not have any interest in it at all. So, this year I thought I would include him by saving the angel for him to put on the tree. So, when he came home from work that day I told him about my plan, he kind of made fun of it but I made him put it on anyways. 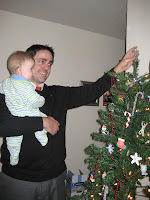 So, here Cameron is with Cade putting on the tiny little angel ontop of our tiny little tree. 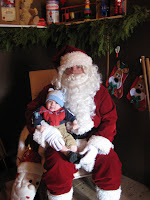 I was very persistant on having Cade visit Santa Claus this year. I finally talked Cameron into going with us the last Saturday before Christmas. Cade wasn't scared at all, I think I actually liked it. Santa let me take my own picture instead of making me pay 15 bucks for theirs, thanks! We spent Christmas with Cameron's family this year. 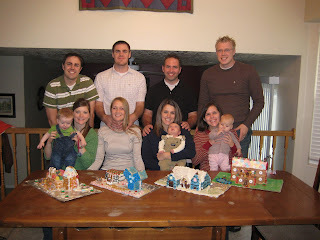 For the first time in years all the siblings and their families were able to be there. It was so much fun spending it with so many people, especially the kids. Cade loved being with all his cousins, but he was a little scared of all the touchy feely from them. His cousin, Lexy, who is only about 2 months older than him loved him to death. She attacked him with kisses and hugs everytime she saw him. He was so scared, haha, it was so funny. 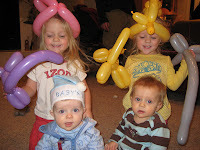 Oh, Cameron's younger brother, Geoff, made balloon animals for all the kids, they loved it! Christmas Eve we all participated in a Nativity program. It was so much fun, or funny to watch. 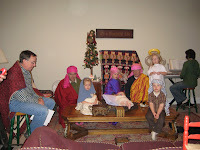 Cade played baby Jesus, he was so good and just layed there the whole time. 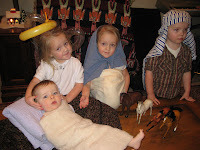 His cousins Chloe and Claire played the angel and Mary great w/ child, and Mason played Joseph. 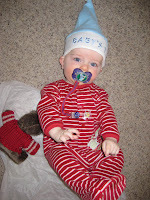 Cade was the first child to wake up Christmas morning @ 7:15. This is him waiting patiently to open his presents, haha. He looks so funny. 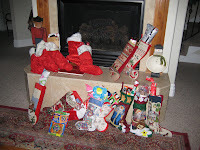 These are all the stockings from Santa. I love how Cameron's mom, Nancy, decorates for Christmas, it's always so beautiful. 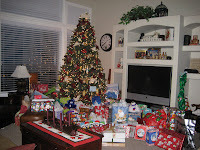 This is the Christmas tree w/ all of our 100's of presents. The other kids finally woke up at around 8:00. 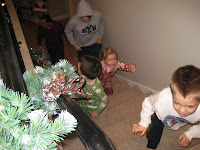 Here they are running up the stairs to open their presents under the tree after already opening their stockings. This was Cade while we were opening presents. We took a break half way throught presents to eat a yummy breakfast and then finished up the presents around 11:00. 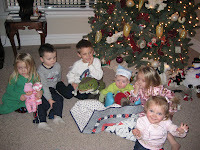 Here are all the grandkids after all the presents, but Lexy, she was taking a nap. Saturday morning we all met back at Cameron's parents house to take family pictures. I didn't get any pictures with everyone, but here is a picture of our little family. We had a wonderful time for Christmas. By the time it was all over we were exausted from all the excitement and lack of sleep. But, we all had a wonderful time being together for Christmas. I hope you all had a wonderful Christmas, at least half as wonderful as us. 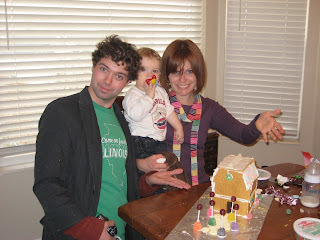 Last Saturday our friends, Lindsey and Joe, had us and 3 other couples came over for a ginger bread house making "contest." We actually did this with them last year too, but w/ only one other couple. 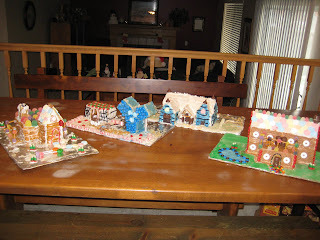 I think Joe had been looking forward to this day since last year when we made the houses. haha We actually didn't use ginger bread, we used graham crackers, just in case y'all were wondering. It was a lot of fun. We didn't actually end up having a winner b/c Joe's mom said she liked them all for different reasons. So you can pick if you want. This is everyone that participated in the "contest." Back row L to R: Geoff (Cam's brother) and Erin, Bill (Cameron and Joe's friend from WA) and his wife and 1 year old son, Eric (Joe's friend from high school) and his wife and 5 month old daughter. 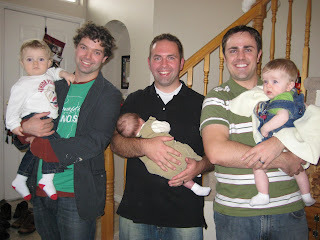 Front row L to R: Joe, Lindsey and their 6 week old son Gabe and finally Me, Cameron and Caden (6 months old). These guys were friends in Washington. They wanted to take a picture w/ each other and their babies. 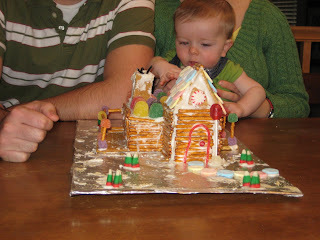 Bill and his family had to leave early, so this is what they could get done w/ their house before they left. It was actually pretty amazing. This is all of us after we finally finished our houses. (Just in case you were wondering, the blue one is a Y for BYU) So, which one do you think is the best? A closer up picture. You can click on it to see it bigger if you want. 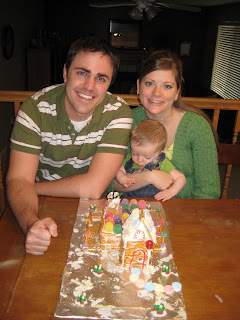 Us w/ our finished house. What do you think? I ended up making it like a log cabin. Cade kept trying to grab it. 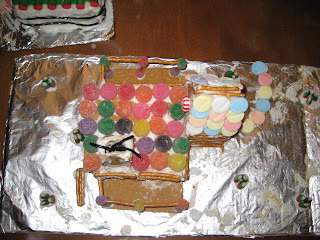 This is the top view of our house. The black stuff is "smoke" (licorice) coming out of the chimney. I haven't posted pictures in quite a while, so hopefully this will make up for the past couple of months. So my mother-in-law, Nancy, decided she wanted to go to CA to visit her mom and sister. So Sunday night, Nov. 9th, she asked me if I would like to drive to Camarillo, CA with her the next morning and stay until Saturday. I thought it sounded fun to go to CA, where it was sunny and warm, but I thought it would be very stressful to get all packed in one night. But, I thought it was worth it to try, so I got all packed and we left at 7 am. 14 hours later, with a 1 1/2 hr traffic jam for 3 mls b/c of a horrible RV wreck, we finally made it. Oh, I forgot to mention, I was carsick from Las Vegas to Camarillo. As soon as we drove off the exit to Camarillo and were waiting at a stop light, I guess my body couldn't hold it in any longer and I threw up right out the car window infront of several other cars. I get extra carsick when I am pregnant, but Nancy had no idea at this point that I was prego yet. So, she just thought I was crazy or something. Sorry Nancy. 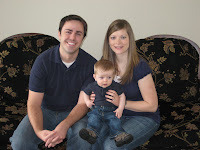 (We were keeping it a secret until right before we went home for Thanksgiving) Cade was wonderful, on the trip. Thankgoodness. Tuesday-We went shopping and out to eat for lunch. Wednesday-Nancy and Aunt Linda took us to a beautiful beach nearby, I can't think of what it's called right now, sorry. Thursday-Come to find out, my sister Camilla was visiting my Uncle Mike in Long Beach for 11 days. So, Camilla drove about an hr and 1/2 or so to pick me up and take me all the way back with her. We went to a fresh sea food restraunt right on the ocean that night. Friday-Camilla, Cade and I hung out all day. We went to In n Out for lunch and finally Uncle Mike came home. We picked up his girls later and went to this yummy restaraunt, the Moonshadows Blue Lounge, over looking the beautiful ocean in Malibu. They took me back to Camarillo and met up w/ Nancy. We went home, packed and Saturday morning we left. The drive home took 12 hours, 2 hrs shorter. Cade was good, but not as great as on the way there. Thanks Nancy for letting me go with you, it was a lot of fun!! I mentioned before that I had not been home for Thanksgiving for 7 years, since I was a senior in high school. So, this year we decided to go home to TN since we were finally both out of school and I was done teaching. Cameron was able to go for a week while Cade and I stayed an extra week. We left at 5:30 p.m. Monday Nov. 24th so Cameron was able to get in some work. We arrived at 12:30 a.m. Thanks Momma and Daddy for picking us up! Tuesday morning Bonny, Chad and her kids came over to break to news to my family about me being pregnant. Bonny was the only one that knew I was pregnant, I needed someone to confide in until we told Cameron's family Sunday before we came home. 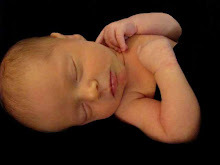 She had told my parents that she was pregnant, just to throw them off. They thought it was a secret and that she was coming over to break the news to us about "her" pregnancy. She made t-shirts for her kids to wear, which I regret now that I didn't take pictures. They said on the front, "Mommy's not really pregnant, but..." and on the back, "Aunt Bitt Bitt is!" (that's what they call me) My mom wouldn't read them at first because she thought she knew what they said. But, when she finally did read them she freaked out! haha She was really excited, along w/ the rest of my family. Most of them didn't believe it, b/c I have a baby! But anways... We mostly hung out the whole time, went out to eat a few times. Wednesday night the boys went to play basketball and then Thanksgiving morning they played touch football. Yeah, Cameron said he was soo sore for a while after that. Thanksgiving day was wonderful!! We had tons and tons of yummy food. 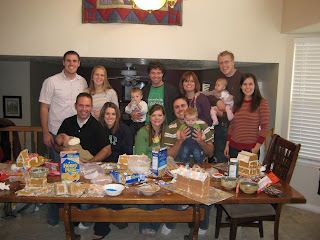 I got to see a lot of my extended family that I haven't seen in a while, some that hadn't even met Cade and Cameron yet. There were about 27 ppl or so all together. It was a lot of fun. Friday morning we went to the temple (the ppl old enough) and then did some shopping. Cameron was getting really sick w/ his head cold by this time, momma got the stomach flu and threw up at the temple. Cade and I caught both of these sicknesses while there, so that was not fun. Cameron left Monday :( Tuesday night Bonny, Momma and I went to watch Twilight. I thought it was pretty good, but the book is definitely better! The rest of the time we just hung out, got sick, recovered and just had fun! So we got back late Tuesday night. Cade slept horrible that night, he woke up every hour and sometimes wouldn't go back to sleep. I ended up sleeping in the living room with him. He cried all through the night. I even turned on Baby Einstein and put him in his swing, he was ok for about 20 minutes, a nice break for me. But anyway, the night was horrible. Luckily Cade was supposed to have his 6 month check up the next day. So we just switched it to a sick visit. We actually both had doctors appointments right in a row. Cameron met up with me so that he could help out with Cade. So, long story short he ended up having a double ear infection. Poor little guy, no wonder he couldn't sleep. Thank goodness for numbing drops!!! They work miracles. After his appointment we went up stairs to my new doctor, who I absolutely love! 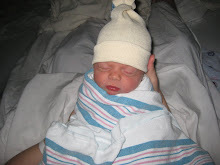 I had to switch doctors because we moved since my 1st pregnancy. My new dr's office has an ultrasound machine and the lab right next door. My last dr had to send me to the hospital each time I needed to have lab work done or an ultrasound. So I am very excited about that. We had my first maternity visit. Everything is going great with the pregnancy so far. He even decided to give me an ultrasound. We found out....thankgoodness....we are only having one. My mom and a few other people were predicting twins! Luckily not, Cade and the next one will be like twins. So, anyways...my life has been crazy these past couple of months. Hope this helps with any of your worries or concerns about what's been going on in my life (ha if any of you have). I will add pictures later. Actually Cameron just found the camera cord...so maybe sooner than I thought. I already posted this on my weightloss blog, but I figured I would copy it and put it on my own blog too. So, here's the news... I have been keeping this a secret for the past 4 weeks. I wanted to wait until I came home and told my family first. So, as you're probably guessing from what I just said...I am pregnant, 9 weeks along. 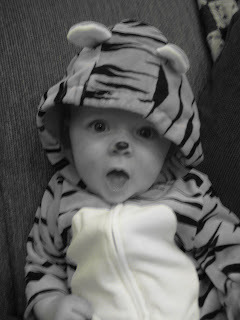 Cade is only 5 months and 3 wks old. I have not been very happy about this fact since I found out. I am trying to be positive, but if you have been following along with my weight loss blog then you know I have been trying my hardest to get back to my normal size and weight. This 2nd pregnancy is putting a huge damper on my plans. I only had about 4 months of freedom from being pregnant. These babies are going to be less than 13 months apart. I am terrified, but I am praying for the strength and patience to get through this. Obviously, this pregnancy was not planned. We were doing everything right to prevent getting pregnant, until next year of course, but it just didn't work. So, obviously Heavenly Father really wanted me to be pregnant AGAIN for some reason. I just have to have faith that this is really His plan and everything Will work out.I'm sorry for going on forever like this, but I just felt like a blog is the place where I can really share my feelings. Any advice, suggestions, cheering up? So here are a couple of tags from Lindsey. 1. Where did you meet? We actually met a few different times. I think we were destined to be together. 1st we were in the same religion class at BYU-I and I actually sat next to him, I didn’t realize it was him until later though. I ended up dropping the class after the 2nd day. 2nd we met in the math lab, I was working in there grading papers and Cameron was doing Math hw. He didn’t really talk to me, but his friend Landon did. That same night we met for the 3rd time through a mutual friend, Paul. He was visiting from Provo and asked Cameron to go to a dance that night w/ him. Paul went there with me and all my roommates, and there he was again, hanging out with our group. So, finally we just kept asking him to hang out with us. So there you go…finally. 2. 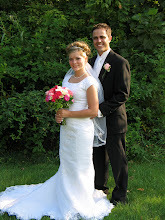 How long did you date before you were married? We were friends for about a month. Dated less than a week and he broke up w/ me to “date other ppl” (he had just gotten off his mission a few weeks before meeting me.) We were friends for about another month and he asked me back out. So, we dated for another 10 months and were engaged for another 4 months. 4.What does he do that surprises you? Sometimes he does the dishes without being asked, he comes home early from work to surprise me, he also surprises me with his gifts for Christmas or birthdays, he is the best gift giver, he remembers things I told him I wanted months in advance. 5. What is your favorite feature of his? His eyes and legs. 6. What is your favorite quality of his? He is so funny, he is always making me laugh. He gets along with everyone, everybody loves him. 11. When was your first kiss? It was actually our first date, which actually wasn’t meant to be a date. We went to the drive-in in Rexburg. We stayed in the back of the truck on the way back home and we kissed. 12. Favorite thing to do as a couple? Be together, watch movies and tv, go out to eat. 13. Do you have any children? Yes, we have 5 month and 4 week old baby. And surprisingly another one on the way. Yes, that’s right I am 9 weeks along. 14. Does he have a hidden talent? He can make his eye balls roll back in his head so it only shows the whites. He can also pop his jaw out of socket to open it huge. 15. How old is he? 25, 26 in exactly a month. 16. Who said I love you first? He did, only because I asked him. 17. What's his favorite music? Um, I don’t know what it’s called but, all the music on Scrubs. Country, and I don’t know what type of music his songs fall inline with. 18. What do you admire most about him? He is a really hard worker, he goes to work everyday and still helps with Cade when he gets home. 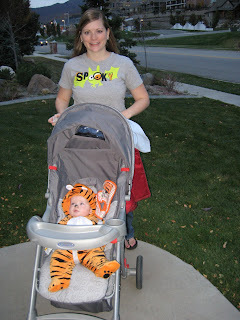 Today was Cade's first Halloween! He was so cute! 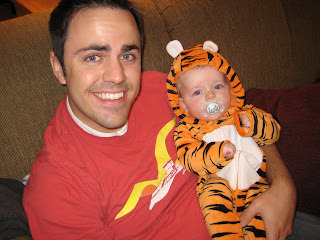 This is the outfit he wore all day, before his costume. 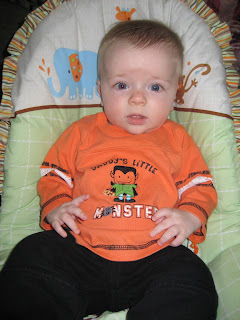 This was his cousin Owen's last year, its says "Daddy's Little Monster." 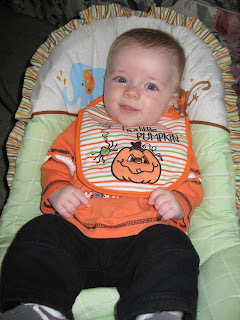 He wore this bib too, his Gammy gave it to him. It says, "I'm a little Pumpkin." 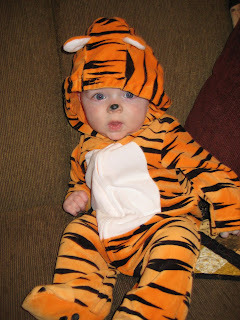 This is Cade in his costume. 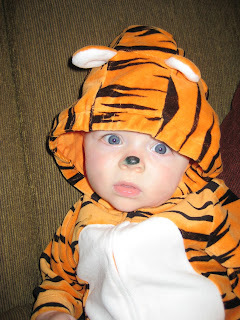 He was a little tiger, people that saw him kept calling him Tigger. 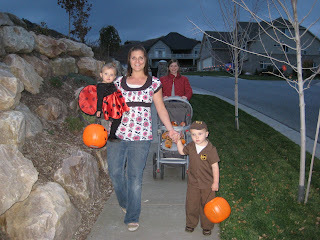 Since Cade is just a little too young to have fun with on Halloween, we decided to meet up with his cousins, Ellie and Mason to walk around with them for trick or treating. 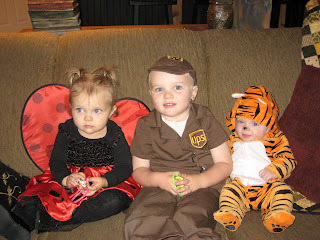 Ellie was a Lady Bug and Mason, a UPS guy. Everyone LOVED his costume! 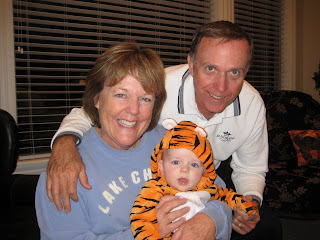 We met up at Grandma and Papa's house for chili and trick or treating. So here they are together! 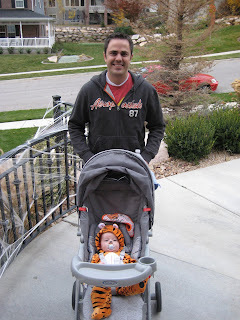 Daddy and Caden following the cousins around while they trick or treat. By the way, this was the 1st time Cade has ridden his his stroller w/o his carrier, he loved being able to see what was in front of him! 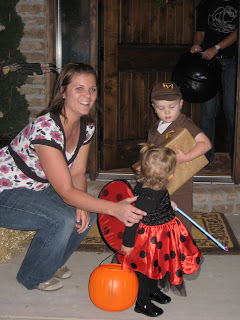 Mason (and yes that is a package he's carrying around), Ellie and Lisa trick or treating. Us walking door to door. In my last post I mentioned how I had to reschedule w/ Lisa, my sister-in-law, to make a craft b/c Cade was so naughty after his shots. 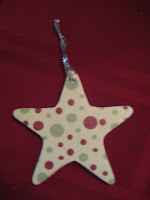 So we got together last Friday and made these really cute, easy crafts. We went to Hobby Lobby, which is the greatest craft store ever! We bought these snowmen, which were plain white and I bought a plain white star ornament. We then got different types of scrapbook paper to decorate them with, oh and Modge Podge. We then traced each piece on the scrapbook paper and then Modge Podged the paper on! Lisa gave me the idea to make the ornament as Cade's first Christmas ornament, so I made a circle and wrote: Caden's first Christmas 2008. So easy, and so cute. Thanks Lisa! Monday was Cade's 4 month check-up. He was a lot better last time after his shots. He has been so whiney the last few days. Tuesday was his worst day, he cried and fussed all day. I was supposed to go make a craft w/ Lisa, my sister-in-law, but I had to reschedule for tomorrow b/c he was so naughty. Luckily, he was ok enough for Cameron and me to have my mother-in-law watch him that night so we could attend the temple. So since last time he has improved a lot with his reflux problem, well at least the pain part of it. He doesn't really cry anymore during eating, but he still spits up all the time. So, because of this the doctor changed his medication to a pill, Prevacid, which dissolves in his mouth and he only has to take 1/2 a pill once a day. Oh, and it tastes a lot better, he hated the liquid and would spit it out, he had to take it twice a day. The only thing bad about this change is that it is a lot more expensive, so hopefully it fixes the problem quickly. So he's a skinny little thing, but at least he has hope of being tall, and he's destined to have a huge head. 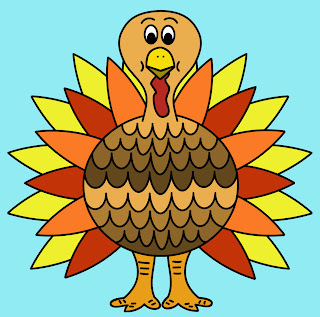 I have not been able to go home for Thanksgiving since I was a senior in High School, so for 7 years. This was was due to the short breaks givin during college and teaching. Now that Cameron is done with school and me teaching, we can actually get enough time off to go home to Tennessee!!!! I am soo excited! Cameron has to work on Monday, Nov. 24th, so we will get there at 12:30 a.m. Monday night, or Tuesday morning, whichever way you want to see it. Cameron will leave early the next Monday morning to get back to work. But, Cade and I are going to stay a whole extra week, until Dec. 9th! So anyway, just thought I would share how excited I am! Yay! Cade recently turned 4 months on the 9th. At Cade's last Doctor's appointment I was told that at 4 months he could start eating baby cereal. I had been looking forward to that day ever since. 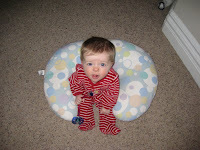 I went out the week before his 4 month and bought him a cute high chair, bowls and spoons. Finally the day before arrived and I couldn't wait any longer, plus I wanted Cameron to be there to record his 1st eating, so I decided to just feed him that night. I was kind of disappointed by his reaction, as you can see in the video why. But, ever since the first time he has been like a little piglet and he loves the stuff. I'll have to add another video later, b/c it's a lot more entertaining now. Oh, this video is a little long, but I knew family would enjoy it. If friends want to watch it, feel free, and enjoy. Tuesday we went to Cameron's brother and sister-in-laws house, Dave and Lisa, for their son Mason's birthday. I noticed while I was there that Eli, their daughter, had the cutest name plaque on her wall. I asked Lisa where she got it and she told me she made it! I was so impressed. 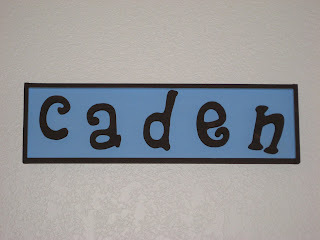 I thought about it that next morning, and I thought it would be cute to have one for Caden. So, I took it upon my self to actually do something crafty, all by myself. Not for a Relief Society activity or anything like that. All on my own. I called Lisa that morning and asked her where she got everything and she told me what to do. I took a trip to Michael's, bought the plague, the letters and paint, and today I put it together. It is the colors of his room, blue and brown. Here is what it looks like, and yes, I am pretty excited I actually made this. I even told Cameron I was going to be crafty now. 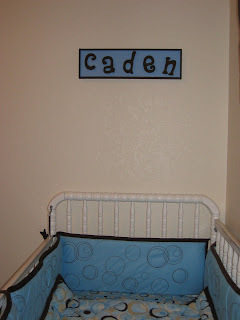 He kinda laughed and said, "ok."
Here's what it looks like above Cade's bed. September 9-19 Cade and I were able to go visit my family in TN. It was wonderful being able to spend so much time w/ them. None of my family members have gotten to meet Cade, except my mom, Bonny and Dallas. Everyone was so excited to meet him for the 1st time. We had a great time!